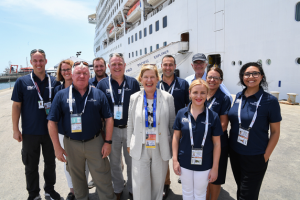 Carnival Australia Chairman Ann Sherry arrived in Port Moresby today to be greeted by the company’s team of ‘blueshirts’ who have been working tirelessly to support the hosting of APEC 2018 in PNG. Three Carnival Australia ships — P&O Cruises’ Pacific Explorer and Pacific Jewel and Princess Cruises’ Sea Princess — are providing accommodation for APEC delegates and the international media. Pacific Explorer is also the venue for the APEC CEO Summit. Ms Sherry is speaking at the Summit this weekend. Earlier this week, Ms Sherry said supporting APEC with the three chartered Carnival Australia ships was “a natural extension” of the company’s relationship with PNG communities. In 2016-18, its ships were scheduled to make 250 port calls bringing 400,000 cruise visitors to PNG destinations.